I’ve heard comments about my weight my entire life. They used to throw me into a tailspin and send me to the vitamin store for a jumbo can of weight gain powder. Now they don’t bother me as much because my skin is elephant-thick. And my scale screams when I step on it these days. But sometimes people say “thinner” because of my CF bones and the look CF etches on my face. What my co-worker probably meant to say is “you look sick in the face,” which makes me think a bag over my head at work would be a good idea. But later that night, when another coworker told me I was looking well, I got confused. Does anyone else get this many comments about their looks? Supermodels need not answer. Why does every local work dinner I go to culminate in a trip to Benihana? What is the allure of the place? Instead of my thoughts on it tonight, let’s hear what Stacey of Confessions of a Cyster thinks of Benihana. She gave me specific instructions to give her credit (in a funny, charming way like only Stacey can do). You have to constantly act impressed with the stupid knife-slinging show…then ohh and ahh at the onion volcano. Seriously, how many onion volcanos do you really have to see in one lifetime. All this while trying to avoid being in the path the one time they slip up. Oops, everybody makes mistakes, right? Exactly, Stacey. You’re right on. Nothing spoils a good night out like a hibachi knife to the chest. I once posted this photo for CG. It's good luck. So, perhaps the screaming chef shouldn't knock it over. I don't want "Brady Bunch finds lost Tiki statue in Hawaii" bad luck. 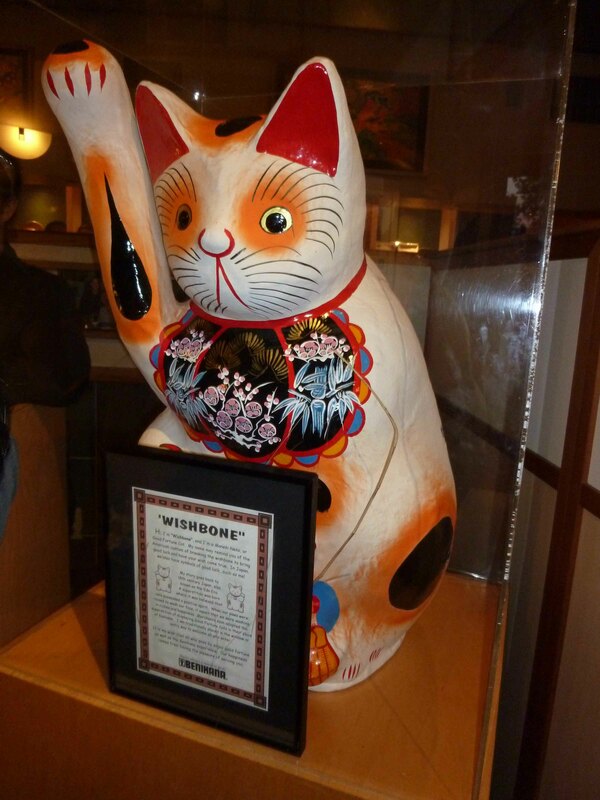 Sorry, Lucky Kitty. Please don't curse or hurt me. The food was good, but the applause for tossing a few shrimp tails into a hat was non-existent. Suggestion for improvement to the Chef: toss a few flaming shrimp tails in your paper hat, let it catch fire, and run screaming from the restaurant, knocking over the lucky kitty and aquarium as you go. That will earn you the standing O you used to receive in the 1970s when your table was filled with onion-volcano virgins. Stay happy and wear a Kevlar vest when eating out. 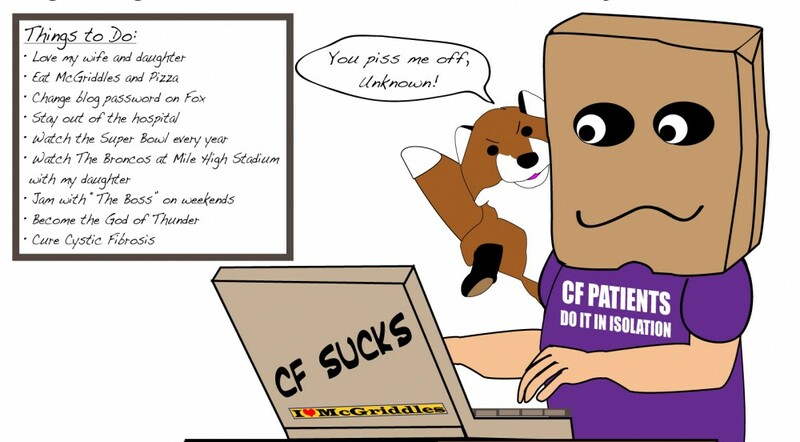 This entry was posted in Adventures in Los Angeles, cystic fibrosis, Fun & Humor and tagged cystic fibrosis, Fun, Human behavior, luck, Rants by unknowncystic. Bookmark the permalink. I think you’re the first man to ever actually follow my specific instructions! Yay for you! I feel like I just got my manhood stripped off me with that comment. Where’s the leash and dog collar? I don’t like being the first. I promise to not follow your instructions next time. Funny about everything tasting the same. You’re right. Kind of a soy sauce and salt taste. Nice observation. Where was that one this morning when you were cranked up? ‘You’re coughing a lot,are you sick?”You are pale’ ‘You look tired’Sigh…. I am so happy you visited. I have something brewing. Some blood streaks these days. Trying to stay out of the hospital.